Your animal has just been shorn. Now the big question, what do I need to do to prepare it for processing? Just as there are many mills to choose from, they each have different requirements as to the cleanliness of incoming fiber. What is universal - The cleaner your fleeces go to the mill, the cleaner your product will return. At America's Natural Fiberworks we like to keep things as simple for the customer as possible. Therefore we have prepared some simple guidelines for you to follow and assess the cleanliness of your own fleeces. We have broken down fleece cleanliness into 4 different levels. Level A, B, C, and D. Below you will find descriptions of each. You will be asked to choose the level of cleanliness of your fleeces when you fill out your processing form. Please realize that we are not labeling if your fleece is good quality or poor quality! These guidelines are put in place to gauge the cleanliness of your fiber when you send it to our mill. It is the same guideline we use to assess your fleeces before we start tumbling. A "Level A" fleece has been professionally sorted and graded by a Certified Sorter. The fleece is free of all vegetable matter and foreign materials. It does not contain any second cuts and very little dirt. While this is NOT mandatory to process fleeces, it helps you to learn more about the fleeces in general. It may help with marketing and selling your product to a higher income market. This service also helps to teach you where the strengths and weeknesses are in your breeding program. With this knowledge you will be able to improve your herd and fleece production year over year. This level typically results in very minimal loss throughout the process. A "Level B" fleece is equal to a show fleece. The fleece is free of all vegetable matter and foreign materials. It does not contain second cuts and has very little dirt. This level will give you optimal cleanliness and produce a premium finished product. This level typically results in minimal loss throughout the process. A "Level C" fleece has a little amount of vegetable matter in the fleece. You will find a small amount of second cuts. This is an avaerage fleece from an animal who has been Shop-Vac or blown out before shearing. The shearers have removed the blanket, and it has been stored seperately from neck and leg hair. This level will give you a clean product that will be a good product to sell. In order for the best finished product, America's Natural Fiberworks reserves the right to process multiple times through the DeHairing process at an extra expense to you. This level will result in an average to above average amount of loss throughout the process. A "Level D" fleece has heavy vegetable matter and foreign material. You will find a lot of second cuts, and neck and leg hair are present. A "Level D" fleece are also those cria fleeces that were never cria shorn. 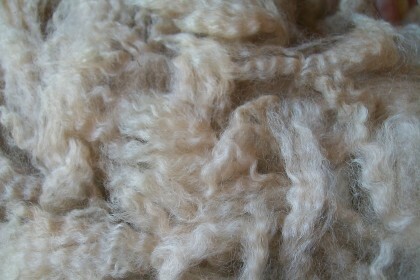 If your first year fleeces were not tipped it will cause excessive breakage and result in a very incosistant yarn. Often called a "hand-spun/mill-spun". This product is still desireable in the market, but may not bring top dollar. In order for the best finished product, America's Natural Fiberworks reserves the right to process multiple times through the DeHairing process at an extra expense to you. This level will result in a heavy amount of loss throughout the process.